Food photography rule number one: light it right. 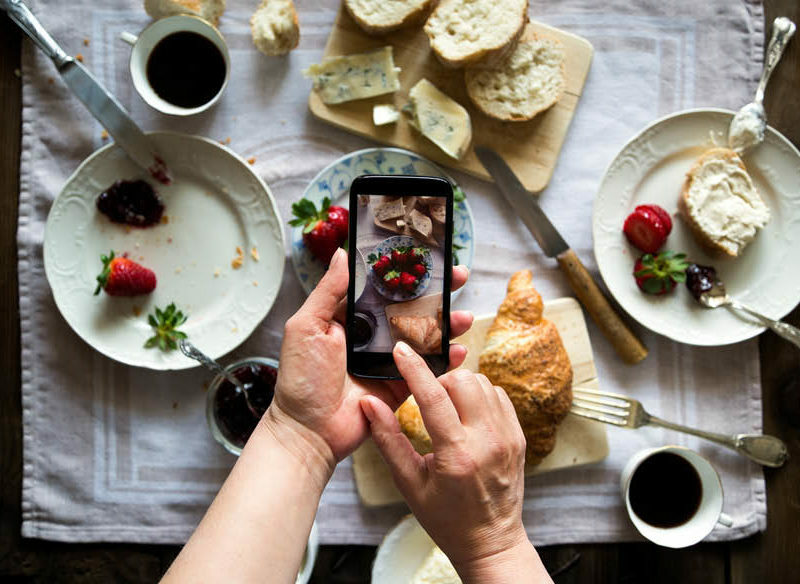 Ready to go next level with your iPhone food photography but not sure how? We hit up a couple of professional food photographers to get the download on how to find the right angles and style each shot, as well as what to avoid and how not to make a nuisance of yourself. Remember the days when waitstaff would arrive at your table with a plate of food and you would take a cursory pause to appreciate how nice it looked before getting stuck straight in before it went limp, cold or congealed? Oh, the memories. These days our dining habits are driven by how many likes we can clock up for close-ups of Nutella-oozing doughnuts or jaunty Boomerangs of clinking glasses of Mumm. In this world, limp lettuce is just accepted as collateral damage on the quest for Insta greatness. How do I know this? Because I, too, am guilty of getting sucked into the addictive frenzy of: “If you don’t ’gram it, it never happened.” But as much as I would love my Instagram feed to look like a thoughtfully curated and perfectly shot #sneakpeek into my fantasy foodie exploits, I have to admit that my own attempts at food photography don’t always cut the truffle mustard. I get to hang out on shoots a lot in my job, so I know that all those elegant flat-lays and perfectly juicy burger close-ups are never just down to good luck and good timing – there’s a lot of skill and some very considered wisdom guiding the way. 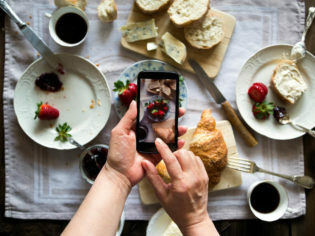 To find out how to elevate my own humble iPhone pics to double-click-worthy new heights, I decided to grill a couple of my professional food photographer pals for their best tips and tricks. Peter Tarasiuk is a professional food, travel and lifestyle photographer based in Melbourne. He has worked on cookbooks for major publishers and shoots for a range of leading magazines in Australia and overseas. Shellie Froidevaux started out as a food blogger, back when Instagram was considered fledgling and niche. Today she has over 43,000 Instagram followers and is a professional recipe developer, food stylist and photographer. She also runs her own business teaching regular folks how to style and shoot food like a pro. Ready to ace your next smartphone shoot? Read on for Shellie and Peter’s top tips, tricks and no-nos. This one was unanimous: natural light is a photographer’s best friend. Shellie and Peter agree that if you can, always try to get a window seat and either back-light the dish (with light coming from behind) or side-light it (have light coming from the side). But prepare to be brutal: if the light isn’t right, maybe don’t take the shot. And never, never, never use a flash – unless, as Peter says, “you’re trying to be the Terry Richardson of food.” Using a flash will make your shot look ugly and is a major etiquette no-no in a restaurant. Consider your fellow diners and turn that flash OFF. *PRO TIP: a white napkin can double as a great light reflector to bounce light into dark shadows. Shellie says simplicity is key when setting up and styling your shot. “Try not to include absolutely everything in the shot, you don’t need to show the whole plate, you can just show half the plate,” she says. “And don’t go overboard with too many props – keep it simple.” Oh, and a word on filters: just no. No one really wants to see a sepia or retro-toned version of your steak. If you want to create some mood or tweak your images, bypass Instagram’s in-built filters and run them through a more sophisticated photo editing app like VSCO or Afterlight. 1. Be quick and don’t fuss. Snap and eat, people! 2. Never stand on a chair to get an overhead shot. If you need to shoot from overhead just stand up (on the ground) and do it that way. 3. Dear lord, turn off that flash. 4. Never tell other people what to do or ask them to move out of your shot – it’s rude. 5. Always be respectful and mindful of staff and fellow diners and try to keep your styling/angling/snapping fuss to an absolute minimum. 6. Put your phone on silent. Nobody needs to hear the scattergun shower of camera clicks. 7. Remember you are in a public place where people are trying to enjoy their meal and be with friends. If you really want to get good and quick at this, practice at home first.